...[T]he practice of waterboarding has roots in the Spanish Inquisition and parallels the persecution of Anabaptists during the Protestant Reformation and the Roman Catholic Counter Reformation. Why did practices similar to waterboarding develop as a way to torture heretics—whether the heretics were Anabaptists or, in the Inquisition, Protestants of any stripe as well as Jews and witches and others? 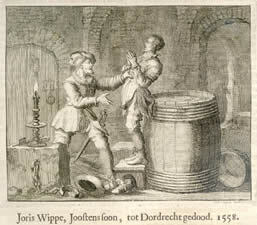 Roman Catholics and Protestants alike persecuted the Anabaptists or "re-baptizers" since these people denied infant baptism in favor of adult baptism. The use of torture and physical abuse was meant to stem the movement and also to bring salvation to heretics. It had been held—at least since St. Augustine—that punishment, even lethal in form, could be an act of mercy meant to keep a sinner from continuing in sin, either by repentance of heresy or by death. King Ferdinand declared that drowning—called the third baptism—was a suitable response to Anabaptists. Water as a form of torture was an inversion of the waters of baptism under the (grotesque) belief that it could deliver the heretic from his or her sins. William Schweiker is the Edward L. Ryerson Distinguished Service Professor of Theological Ethics at the University of Chicago Divinity School, and director of the Martin Marty Center. These are solemn words. One wonders what considerations led the Congress to confirm the new attorney general. Excellent tying together of threads. I just referred to parts of your work for my letter to President Bush which is on my blog. Thanks.